I could not think of a more fitting topic to write my first blog about than public engagement and outreach. This topic is becoming vital in the academic world and rightly so. I care about it so much that I set up a blog to showcase my science and share my experiences with anyone who wants to read them (or accidentally clicks on them!). For me science is much more than just projecting my work to other academics. Although this is obviously an important part of my work, I also think that it is a requirement to communicate this work to….well, everyone in an accessible manner. Further, science has given me so much enjoyment that I find myself compelled to try and enthuse others about it too, or to enthuse them about a topic they enjoy. 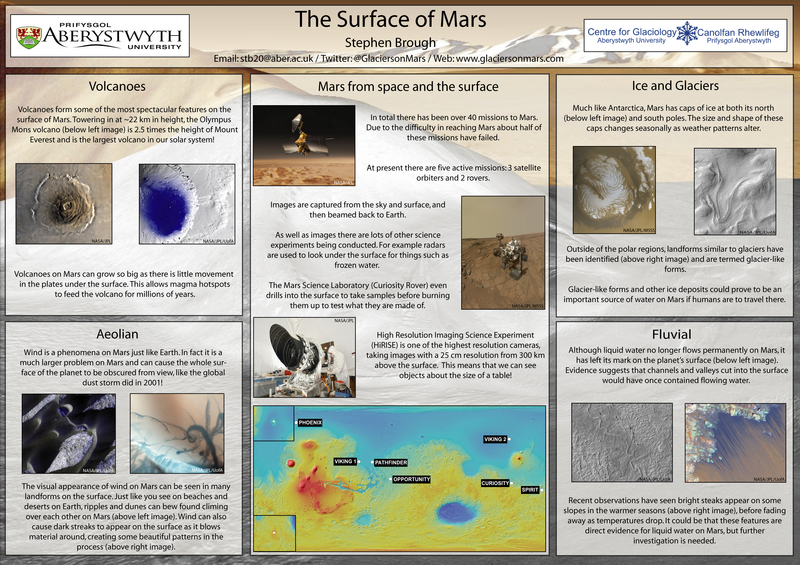 Earlier this year I was involved with the National Science and Engineering week at Aberystwyth University. 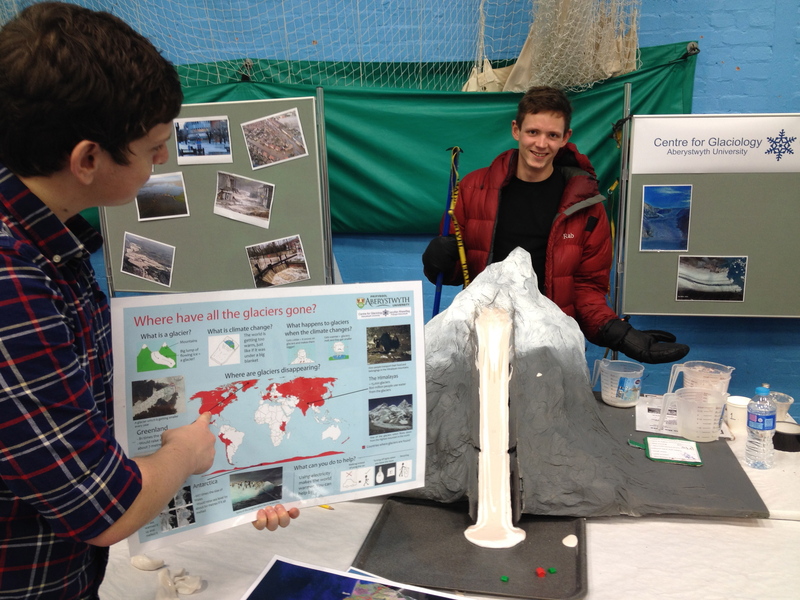 Here I, along with others from the Centre for Glaciology, ran a stand discussing all things glacial. We had pictures, posters, field equipment and a working model showing how glaciers flow. Over 1,000 school kids visited us in three days and from the questions we were asked and the noises they were making they enjoyed it. I certainly did. Centre for Glaciology members showing off all the stand had to offer. As part of the first year of a PhD we are asked to showcase our PhD projects for a public open day, something which I was delighted about. Here local schools are invited to come along in the afternoon, before the event is opened to the general public later in the evening. So if you are around Aberystwyth between 6 – 8 pm, Thursday 14th June (today), and have always wanted to ask ‘what do PhD students actually do’, then why not join us in the Old College – if nothing else for a view inside the beautiful building! 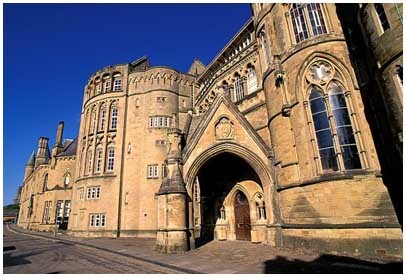 The entrance to the Old College, Aberystwyth University (source: Wikipedia Commons). 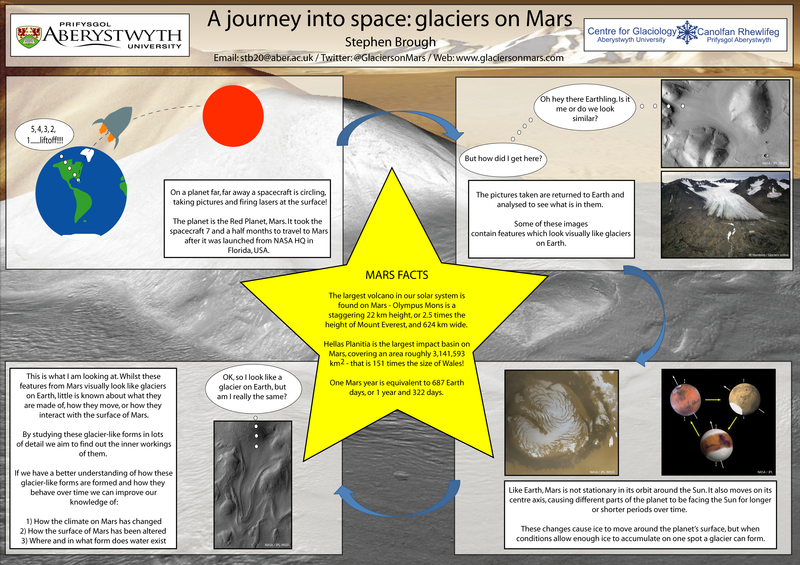 For those of you not in Aberystwyth or who can’t make it, don’t worry, I have uploaded my posters below. I decided to do two of them. The first one is aimed for school kids and it explains my PhD in hopefully an engaging way. The other is a more general poster about Mars and I made this to excite the mind as to what is actually going on up there. I hope you can tell which is which! I will also be part of the universities’ Access All Areas day. Here anyone can get a behind the scenes view of what staff and students get up to, ask them questions and get involved in numerous activities. Again if you are free why not come along on Saturday 21st June. Further information including times can be found here. So yeah, now you know a little bit more about what is going on keep an eye out for new posts. Or even better set up your own events / volunteer at an event and tell me (and the World) about it.